Guests arriving shall be warmly welcomed by Mairi and Sean Mansell, who will ensure that your stay is both comfortable and relaxing. There is ample private parking at our home with steps leading down to a delightful secluded garden. 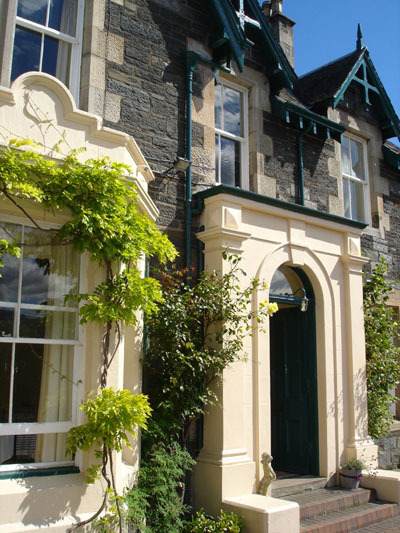 With only a short walk to Pitlochry town centre you shall find great shops, excellent restaurants, and the lovely Victorian quality of the town. Also within walking distance you shall find the River Tummel and Loch Faskally with Pitlochry’s famous dam and salmon ladder and our internationally renowned festival theatre, known as the ‘Theatre in the Hills’. As well as high quality plays and a picture gallery and the theatre is open all day for morning coffee, lunch and dinner and is a perfect spot to just sit and watch the salmon leap from the river. To make a booking please use the email form on the contact page or telephone (0044) 01796 473704. To see the most up to date photos, use the box at the top of the page and go photos.